A celebrated soldier, admired politician and founding father of the state of Tennessee, John Sevier led an adventurous life. He commanded a frontier militia into battle against British Loyalists at Kings Mountain. He waged a relentless war against the Cherokees in his effort to claim America's first frontier. He forged the state of Franklin from the western lands of North Carolina and later became Tennessee's first governor. Following his death, Sevier's accomplishments faded from public memory, but years later, writers resurrected his image through romanticized accounts of his exploits, relying heavily on folk tales and recollections from aging pioneers. Thus, life and legend intertwined. 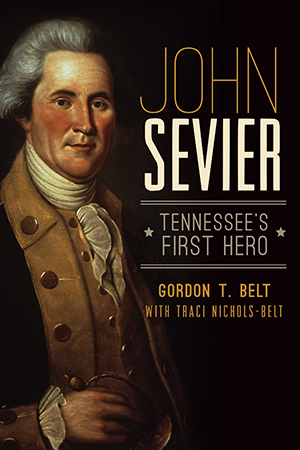 Join authors Gordon T. Belt and Traci Nichols-Belt as they examine John Sevier's extraordinary life through the lens of history and memory, shedding new light on this remarkable Tennessee figure. Gordon T. Belt is an information professional, archives advocate, public historian and founding editor of the Posterity Project, an award-winning blog devoted to archives and history in Tennessee. Gordon holds a master's degree in history from Middle Tennessee State University and a bachelor's degree in political science from the University of Tennessee at Chattanooga. He is the director of public services for the Tennessee State Library and Archives. Traci Nichols-Belt is the author of "Onward Southern Soldiers: Religion and the Army of Tennessee in the Civil War," published by The History Press. She is an ordained and licensed minister and holds a master's degree in history from Middle Tennessee State University and a bachelor's degree in political science from Anderson University.